This analysis is primarily focused on the “highest calibre” standard employed by the independent appellate panel when making its decision whether to grant a non-EU footballer a work permit, when said footballer does not meet the initial requirements.3 Prior to discussing the standard, it is first necessary to provide some context as to why the work permit regulations in England are far more restrictive than elsewhere in Europe.4 In addition, this piece will endeavour to show how Premier League clubs are sidestepping the work permit issues by utilising the European loan system. There is an independent panel that is specifically tasked with hearing work permit appeals from non-European footballers and the clubs desiring their services. The nature of the panel and the appeals process will be discussed in a later section of this article. As of March 2014, Premier League clubs have fielded, on average, 1.6 non-European players per club, the fewest of the “Big Five” leagues.17 For reference, Serie A averages 3.2 non-European players per club, La Liga averages 2.5, Ligue 1 averages 2.4, and the Bundesliga averages 1.7.18 The small number of non-European players in the Premier League is punctuated by the fact that the Premier League actually fields the most foreign players out of the “big five.” On average, Premier League clubs field 7 foreign players, compared to 5.9 in Serie A, 4.6 in the Bundesliga, 4.2 in La Liga, and 3.6 in Ligue 1.19 Percentage-wise, therefore, only 23% of foreign players in the Premier League come from outside Europe. This is in stark contrast to the 69% in La Liga, 67% in Ligue 1, 54% in Serie A, and 37% in the Bundesliga. When the independent panel was initially formed, just prior to the start of the 1999-2000 season, both the panel composition and the rationale behind the decision were made public.27 Now, however, the panel’s deliberations are confidential and the breakdown of the votes are not disclosed to the public, or even to the appellate club or among the panel itself.28 Only the final decision as to whether to endorse the player’s work permit is made public. As the table illustrates, players from Brazil, in particular, have had great success in qualifying under the “highest calibre” standard, albeit for different reasons. At most, there are fourteen players who can feature in each relevant international fixture. With Brazil’s historically deep talent pool, the panel has likely recognised that it is unreasonable to place too much emphasis on a Brazilian player’s international career when considering whether he is of the highest calibre. However, curiously, Henrique and QPR were denied a work permit in January 2012. The young Brazilian striker won both the Golden Boot (top scorer) and Golden Ball (best player) in the 2011 U20 World Cup, no small feat considering he was sharing the pitch with teammates Oscar, Philippe Coutinho, and Danilo. On paper, his appeal could have compared favourably to the successful appeals of other young players without much senior international or European experience, such as Tandanari Lee, Roger Espinoza, Yun Suk-Young, Ángelo Henríquez, and Sebastián Coates. As a result, QPR elected not to sign Henrique. Other recent examples of players failing to secure a work permit can be found in the following table. In contrast to QPR’s decision not to sign Henrique, Stoke City signed Juan Agudelo in January 2014, despite failing to secure a work permit for the 20-year-old American striker. Stoke City immediately loaned Agudelo to Eredivisie club FC Utrecht. Similarly, Chelsea was unsuccessful in its numerous attempts to secure a work permit for Serbian defender Slobodan Rajkovic and he spent four seasons on loan in the Eredivisie. Rajkovic, who originally signed as a teenager, was eventually sold to Hamburg and never played a competitive match for Chelsea due to never being able to meet the “highest calibre” standard. Premier League clubs wishing to acquire young non-EU players likely recognise the potential work permit issues, and as such, will send that player on loan elsewhere in Europe and hope that the player will bolster his footballing CV enough to eventually secure an English work permit. The average age of a Premier League player being sent on loan is 22.5 years old.36 It is exceptionally rare for a twenty-two year-old to have been firmly ingrained into his senior national team for two years, and as such, he will not meet the “75 per cent” requirement. Further, in the era of financial fair play (FFP), wealthy clubs with European ambitions can no longer build their squads exclusively through the highly inflated transfer market. Clubs must now offset their costly purchases developing low-cost talent from within the club. Accumulating young talent on loan is an ideal “low-risk, high reward” scenario. Staying with Chelsea as an example, I estimate that, as regards to FFP accounting practises, the cost of Chelsea’s loanees for the 2013-14 season is £29.3m.42 Given the relatively small financial commitment required to field an army of loanees, Chelsea only needs to develop a few players with first-team potential for this strategy to be economically viable. The sale of Kevin de Bruyne and the development of Thibaut Courtois and Romelu Lukaku are examples of how this strategy has been successful. Even the players that don’t work out, such as Jeffrey Bruma, can often still be sold for modest amounts that will cover most, if not all, of the club’s costs associated with the player’s development. The FA has a vested interest in ensuring that young English players have the opportunity to thrive in the Premier League. The number of English players in the Premier League has dwindled from seventy-three percent during the 1992-93 season to thirty-two percent at the start of the 2013-14 season.43 Given that European footballers are afforded free movement, the FA has turned its attention on tightening restrictions on work permits for non-EU footballers. This mirrors the growing national sentiment on immigration. The highest calibre standard is specifically tailored for granting older, established players work permits. This standard makes it difficult for clubs to bring in young non-EU players, and it will likely become even more difficult in the future. The advent of the financial fair play era in European football has made it necessary for clubs to wean themselves from heavy reliance on making costly purchases in the transfer market. As a way to mitigate costs, clubs have a renewed focus on youth development, which is a much more cost-effective way of building a talented squad. Forward-thinking clubs have turned to the loan system as a way to bypass the work permit restrictions. Premier League clubs will likely continue to accumulate young talent from all over the world at an increasing rate. It will be interesting to see the response from other national football bodies, as their clubs will be developing players from other countries owned by English clubs, rather than players from their own countries owned by their own clubs. Content summary: This analysis is primarily focused on the “highest calibre” standard employed by the independent appellate panel when making its decision whether to grant a non-EU footballer a work permit, when said footballer does not meet the initial requirements. In addition, context is provided as to why the work permit regulations in England are far more restrictive in England than elsewhere in Europe. Lastly, this piece endeavours to show how Premier League clubs are sidestepping the work permit issues by utilising the European loan system. 1. See, Home Office, Statement of policy for changes to the points-based system, at 6, available at https://feedback.kingsleynapley.co.uk/files/uploads/documents/12%2011%2021-Statement-of-Policy-for-Changes-to-the-points-based-system-v3-2.pdf (on the November 2012 removal of the Tier 1 Investor Visa path towards a work permit). See also, Stoke City FC, Work Permit Appeal Unsuccessful, available at https://www.stokecityfc.com/news/article/work-permit-appeal-unsuccesful-1185799.aspx (in which Stoke City CEO Tony Scholes said, following the unsuccessful Juan Agudelo work permit appeal in November 2013, “we are therefore left amazed that our application for a work permit for Juan has been rejected when you compare his talent and ability to players who have been granted a work permit on appeal in the past.”). 2. Citizens of Iceland, Liechtenstein and Norway are also exempt from these regulations by virtue of participation in the European Economic Area (EEA). In addition, citizens of Switzerland are also exempt by virtue of participation in the single market. 4. In Finland, Bulgaria, and Austria, for example, non-European footballers need only provide the international transfer certificate and a valid work permit from their previous country of employment in order to be eligible to work as a professional footballer. In France, non-European players must also secure a residence permit, and footballers qualify for a three-year renewable la carte compétences et talents (“skills and talents”) residence permit. The skills and talents permit can be acquired after submitting documentation that the player has gainful employment and sufficient finances, which is likely very easy for every footballer to prove. In Demark, Portugal, and Belgium, work and residence permits are conditioned upon providing a clean bill of health and evidence that the player will be able to support himself financially. In Denmark, for example, the required monthly income is a modest (by European footballing standards) €2,500. In Spain, non-European players simply need to provide copies of the professional contract with the club, the international transfer certificate, and an identity document and valid passport with a notarised acknowledgement of receipt from the embassy of the player’s country of origin. See, European Union, Study on training of young sportsmen/women in Europe. Extension Part II – Home-grown players rule. 5.Official Journal of the European Union, Consolidated Version of the Treaty on the Functioning of the European Union, available at https://eur-lex.europa.eu/LexUriServ/LexUriServ.do?uri=OJ:C:2008:115:0047:0199:EN:PDF. Also, note that under Deutscher Handballbund eV v Maros Kolpak [C-438/00] (available at https://eur-lex.europa.eu/legal-content/EN/TXT/?qid=1402581073155&uri=CELEX:62000CJ0438), citizens of non-EU countries which have association agreements with the EU have the same free movement and working rights as EU citizens. This principle was further expanded upon in Igor Simutenkov vs. Ministerio de Educación y Cultura and Real Federación Española de Fútbol [C-265/03] (available at https://eur-lex.europa.eu/legal-content/EN/TXT/?qid=1402582327765&uri=CELEX:62003CJ0265). However, in 2008, the European Community reversed course, holding that association agreements and Cotonou agreements (treaties between the EU and the African, Caribbean and Pacific Group of States) “do not lay down a principle of free movement for third-country workers, the principle of non-discrimination laid down in such agreements also applies to rules laid down by sports federations.” Further, the Community now holds that “access of [non-EU citizens] to the labour market of Member States is a matter for domestic law. Decisions whether to allow access to employment in sports clubs in Member States are, therefore, the responsibility of the competent national authorities.” See, European Parliament, Parliamentary questions - Joint answer given by Mr Špidla on behalf of the Commission [E-2771/08], available at https://www.europarl.europa.eu/sides/getAllAnswers.do?reference=E-2008-2771&language=EN. 6. As specifically applied to the free movement of footballers (but having wide-ranging applications for other sportspeople beyond the football pitch), see Union Royale Belges des Societes de Football Association and others v Bosman and others, C-415/93. For more recent examples of the ECJ removing national barriers to employment, see generally, International Transport Workers’ Federation v. Viking Line ABP, C-438/05, Laval un Partneri Ltd. V. Svenska Byggnadsarbetareförbundet and Others, C-341/05, Rüffert v. Land Niedersachsen, C-346/06, and Commission of the European Communities v. Grand Duchy of Luxembourg, C-319/06. See also, David Meca-Medina and Igor Majcen v Commission of the European Communities, C-519/04 (holding that European competition law applies to sport). 7. See, European Union, Study on training of young sportsmen/women in Europe. 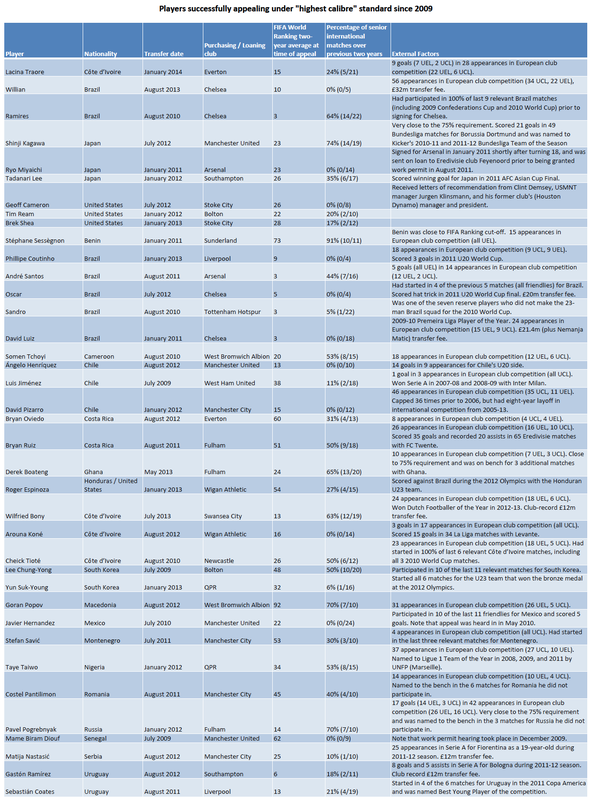 Extension Part II – Home-grown players rule (comparing work permit requirements for non-EU footballers across domestic leagues). See also, BBC, Ed Miliband vows to end UK's 'dependency' on cheap foreign labour, 5 January 2014, available at https://www.bbc.com/news/uk-25607578 (on the growing national concern that the influx of low-skilled foreign labour will hurt the economy, supporting the notion that this issue goes well beyond Premier League football). 8. See, Scott Blinder, UK Public Opinion toward Immigration: Overall Attitudes and Level of Concern, COMPAS, University of Oxford, available at https://www.migrationobservatory.ox.ac.uk/sites/files/migobs/Public%20Opinion-Overall%20Attitudes%20and%20Level%20of%20Concern.pdf (finding that over 75% of Britons are in favour of increased controls on immigration and further, that there is significantly more opposition to immigration in the UK than there is in France, Germany, Italy, Spain, and the United States). See also, Martin Ruhs and Carlos Vargas-Silva, The Labour Market Effects of Immmigration COMPAS, University of Oxford, available at https://www.migrationobservatory.ox.ac.uk/sites/files/migobs/Briefing%20-%20Labour%20Market%20Effects%20of%20Immigration_0.pdf (suggesting that immigration from outside the EU could have a negative impact on the employment of UK-born workers, especially during an economic downturn). 16.For reference, those clubs include (in order of total minutes played for England in the 2014 WCQ by the club’s players): Manchester United, Manchester City, Chelsea, Liverpool, Everton, Tottenham Hotspur, Arsenal, Southampton, and West Ham United. See, Centre International d’Etude du Sport Football Observatory, 2014 World Cup Preview, at 17. Available at https://www.football-observatory.com/IMG/pdf/wc2014_preview.pdf. 21. For a general overview on how the FIFA World Rankings are calculated, see FIFA, Frequently asked questions about the FIFA/Coca-Cola World Ranking, available at https://www.fifa.com/mm/document/fifafacts/r&a-wr/52/00/95/fs-590%5f05e%5fwr-qa.pdf. For details on the specific formulae FIFA uses to determine the rankings, see FIFA, How are points calculated in the FIFA/Coca-Cola World Ranking?, available at https://www.fifa.com/mm/document/fifafacts/r&a-wr/52/00/97/fs-590%5f10e%5fwrpoints.pdf. 23. UK Border Agency, Points Based System Skilled Tier 2 (Sportspeople) And Temporary Tier 5. Sporting Code Of Practice For Sport Governing Bodies, 2008 (the UK Border Agency requires that there be a work permit appeals process for sportspeople). 30. While considerable efforts were made to provide as comprehensive a list as possible, the author does not make any representations that this is the complete list of players who were granted a work permit under the highest calibre standard since 2009. 31. The panel decisions haven’t been made public since 2000, but the available decisions shine light into the nature of the proceedings. For example, when the panel was discussing whether Estonian striker Indrek Zelinski would be granted a work permit to join Blackpool, “there was substantial and heated discussion as to the quality of the player and the Panel's view as to a comparative level of skill within the English game.” See, Education and Employment Committee, English Panel held on 10 September 1999, available at https://www.publications.parliament.uk/pa/cm199900/cmselect/cmeduemp/218/0021622.htm. As another example, the panel issued a 5-1 decision in favour of granting Chelsea target and Georgian striker Rati Aleksidze a work permit, finding that “although still young in terms of International experience, Mr. Aleksidze was a player of outstanding ability. He is an attacking midfielder who plays predominantly on the left of which there is a current dearth in the English game.” See, Education and Employment Committee, English Panel held on 21 January 2000, available at https://www.parliament.the-stationery-office.co.uk/pa/cm199900/cmselect/cmeduemp/218/0021628.htm. Other panel decisions include discussions as to overall fitness, future potential, the player’s skill level, the level of competition against which the player has been tested, comparisons between the player and other players already competing in English football, and how other footballers from the player’s country of origin have fared in English football. 32.The FA Chairman’s England Commission, at 75. 35. As an example of a club’s decision-making process involved in utilising the loan system for the purposes of developing young non-EU players ineligible for a work permit, when discussing Chelsea’s decision to sign and subsequently send the then-nineteen year old Brazilian defender Wallace to Inter Milan on loan, manager Jose Mourinho said “'He is a good player but he won't be staying with us because we have [Branislav] Ivanovic and [Cesar] Azpilicueta for the same position and he's also non-EC so we'll not get the visa. It will be too early, so he'll go on loan for a season.” See, Matt Barlow, Daily Mail, Chelsea forced to send Brazilian Wallace on loan due to permit issues, 18 July 2013, available at https://www.dailymail.co.uk/sport/football/article-2368335/Chelsea-send-Wallace-loan-work-permit-issue.html. 36. For comparative purposes, the European average is 23.7 years and the average age of loanees from the other “big four” domestic leagues is as follows: La Liga, 24.6 years; Bundesliga, 24.5 years; Ligue 1, 24.4 years; Serie A, 23.4 years. See, European Club Association, Study on the transfer system in Europe, at 102. Available at https://www.ecaeurope.com/PageFiles/7462/ECA%20Study%20on%20Transfer%20System%20in%20Europe_WEB%20version.pdf. 37. See, e.g. Christopher Atkins, ESPN, Right to Dream Academy Making Gains in Europe, 17 February 2013, available at https://www.espnfc.com/blog/scouts-notebook/78/index. 40. European Union, Study on training of young sportsmen/women in Europe. Extension Part II – Home-grown players rule, at 12. 42. 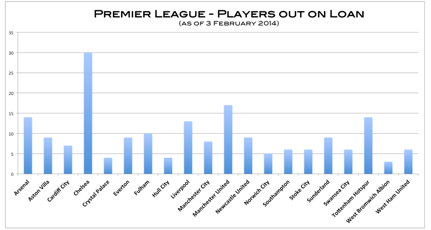 Figure derives from the Chelsea player wage database created by the author. The most recent update (reflecting the club’s winter 2014 transfer activity) can be accessed at https://weaintgotnohistory.sbnation.com/2014/2/6/5367682/chelsea-wages-player-database. Note that the figure does not include the £10.84m FFP profit Chelsea recorded from the sale of Kevin de Bruyne (the full financial details of which can be accessed at https://weaintgotnohistory.sbnation.com/2014/1/18/5304044/kevin-de-bruyne-transfer-chelsea-wolfsburg-finances). Adding the De Bruyne profit would reduce the cost of Chelsea’s loanees to £18.46m for 2013-14.